We feel extremely fortunate to have been given the opportunity to spend a few months in northern New England. We're currently in Vermont and my folks live a few miles away across the Connecticut River in New Hampshire. Cameron attends school in Jefferson, New Hampshire, in the shadow of mountains named Washington, Adams, and Madison. 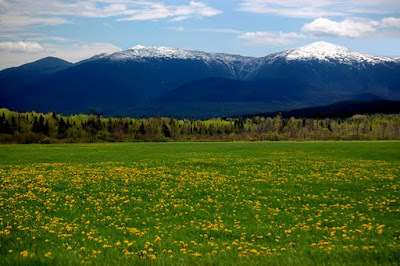 The Presidentials from Jefferson Meadows, New Hampshire. The area has an abiding sense of honor for the early leaders of this country. New Hampshire's motto isn't some catchy new hook to pull tourists. When you see a NH license plate, you're looking at words that were penned over 200 years ago...by a guy named John Stark, one of the area's Revolutionary War heroes. Live free or die. That'll pull the tourists in. Death is not the worst of evils. Now there's a cheerful little ditty for your license plate. But is it true? Are there worse evils than death? When I got the news that Paul had died in a crash, I can tell you that his death felt like the deepest of evils. And, in one sense it was. God's original design didn't have death in the picture...and when He restores all things, we return to that original design and death goes away once again. Death entered the picture as the natural consequence of sin...corrupting and destroying the paradise God created on this planet. In the wake of a sudden and tragic death, I can hardly imagine even the most hardened atheist not resonating with the feeling that something is dreadfully wrong in this place...this isn't supposed to happen. And that's true, death isn't supposed to happen. We were designed for life, not death. This is why it is such good news that God gives us a way back to what we were designed for: life. Abundant. Eternal. And because I know somewhere deep in my soul that Paul is finally enjoying life as it was originally meant to be, his death doesn't feel evil any longer. In the hours after I got the news, it shames me to admit that my courage, faith and motivation deserted me like fair-weather friends. I wanted to quit. The costs were simply too high. Through a process of time and gentle mercy, God brought Sheri and I to a place (she got there first) where we could re-count the cost, stare the risks in the face, and feel a wonderful peace. It is a peace that comes from seeing Jesus standing on the path, beckoning us to follow Him...and realizing there is no other place we'd ever want to be than hand in hand with Him on the path of His choosing. General Stark was right, death is not the worst of evils. To allow fear, unbelief and discouragement to push us off His path...that would be a triumph of evil much worse than death.